Looks great and I love cauliflower cooked in this way. 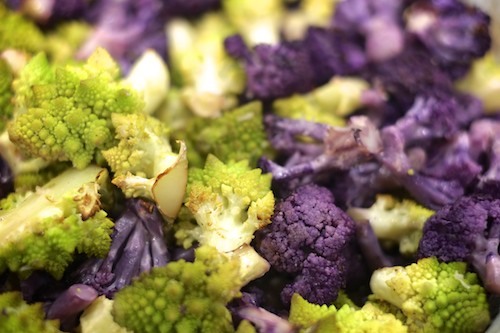 Haven’t seen the purple cauliflower before, I have to say. Can’t say it really tastes different but the color is pretty cool. This is very typical of Rome! 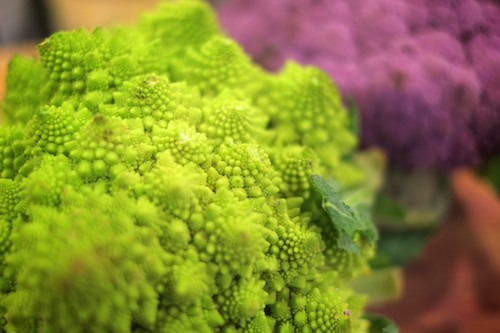 By the way, tonight we are having Vellutata di broccolo romano ( cream of romanesco)! Wonderful. I’ve even heard it called Roman Cauliflower. I am definitely a fan. I love those alien cauliflower heads. I have 3 sitting in my refrigerator. I would expect the purple color to hold a lot better than when it is steamed. Thanks for the idea – your photo makes me want to head to the grocery store! It actually held up better than I thought it would. I thought the color mix with the green was nice.